I wish I was this young and careless (again). Submarine is a nearly flawless, charming, coming of age story of love, heartbreak, and adolescence from British comedian Richard Ayoade. Everything about it feels honest without trying to be too clever or self-aware. It's a small film of tender moments and youthful idealism. Clearly influenced by Wes Anderson (think Rushmore) and the quirkiness of 2000s indie cinema, Ayoade's assured direction and camera work never goes too far with its style. His beautifully shot and framed sequences don't betray the bland, mundane, everyday landscape of Wales while still infusing vibrant scenes of underscored wit and emotion. Based on the award-winning novel by Joe Dunthorne, Submarine is a simple story told exceptionally well, executed with sharp, underplayed writing, direction, and acting. 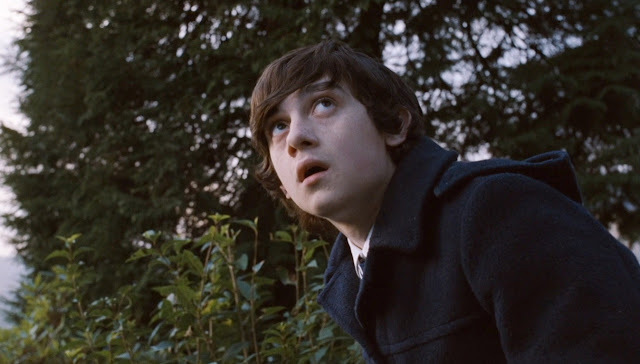 Lead Craig Roberts plays Oliver, a socially awkward boy who has delusions of grandeur and obsessive personality. He narrates his own imaginary biography and falls in love almost accidentally. I, too, fell in love with Yasmin Paige, the gruff, detached, bullish, and imminently vulnerable Jordana. Both are abundantly likeable and sympathetic. Set against scenes of cold beaches, light arson, fireworks, playground bullying, and general mischief, Submarine is timeless yet very reverent. Things simply just unfold in quiet, fun, cinematic ways. There is a strong sense of stylistic imagery edited seamlessly together without being distracting. Submarine captures the confusing yet exhilarating experience of youth with quirk, charm, and harrowing sweetness. It plays as a splendid debut feature and stark look at relationships both young and old. Please watch the flawlessly edited and beautiful trailer below. It feels like a superb short film on its own.